Buy More Color Tissue Paper 15x20 Save More! 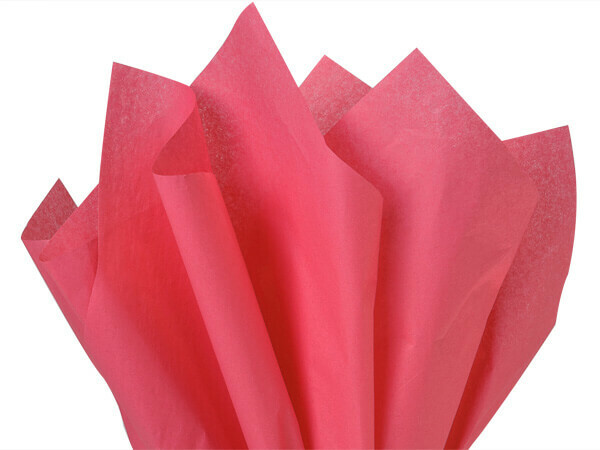 Azalea Pink Color Tissue Paper 15x20" sheet - 480 sheets per pack. Color Flo Tissue Paper is made from 100% Post Industrial Recycled Fibers. Green Way ® Eco-Friendly Packaging. Made in the USA. The colors just don't stop! Our wide selection of colored tissue paper is sure to hold the exact colors you are looking for. Laid flat and bulk packed, with 480 sheets, means you don't have to worry about the tissue paper arriving full of creases. Plus, it is so easy to set this pack on the shelf and quickly grab one as needed! The 15x20 colored tissue paper sheets work perfectly in our rose and jewel gift bags! They are also useful in small boxes to wrap and help protect the items inside. Gift bag tissue paper is not just used for packaging any more. It is great for decorations too! You can use it to make fun crafts like tissue paper flowers and tassels! Offered at wholesale prices, you don't have to choose just one of our many tissue paper colors! For those of us who like variety, opt for one of our tissue paper assortments instead. Made in the USA with tradition and innovation, we have no problem backing our product! Guaranteed through blind testing, our 100% recycled Green Way® tissue paper has been consistently shown to be equal to or exceed the look and feel of any color tissue on the market today. Being a 100% genuine recycled tissue paper, there is a slight chance of short fibers showing tiny specks or pin holes. However, you can rest assured that these do not take away from the look and performance of our tissue. Pair with one of our Deluxe Gift Bags or Printed Paper Shopping Bags for a complete look!